Mencom is pleased to announce new Low-Profile enclosures for Panel Interface Connectors (PIC). The PIC, also known as programming ports, programming interfaces, or interface ports, provides the ability to communicate with a device inside a cabinet without opening the cabinet door. This helps prevent potential safety hazards (such as Arc Flash) associated with opening an electrical panel. Utilizing a PIC allows users to maintain compliance with stringent safety industry regulations while saving time and money. The use of a PIC eliminates the need for costly personal protective equipment (PPE) and a licensed electrician to access the inside of the cabinet. Mencom’s new Low Profile PIC design protrudes from the side of the cabinet 75 percent less than the standard metal housings. 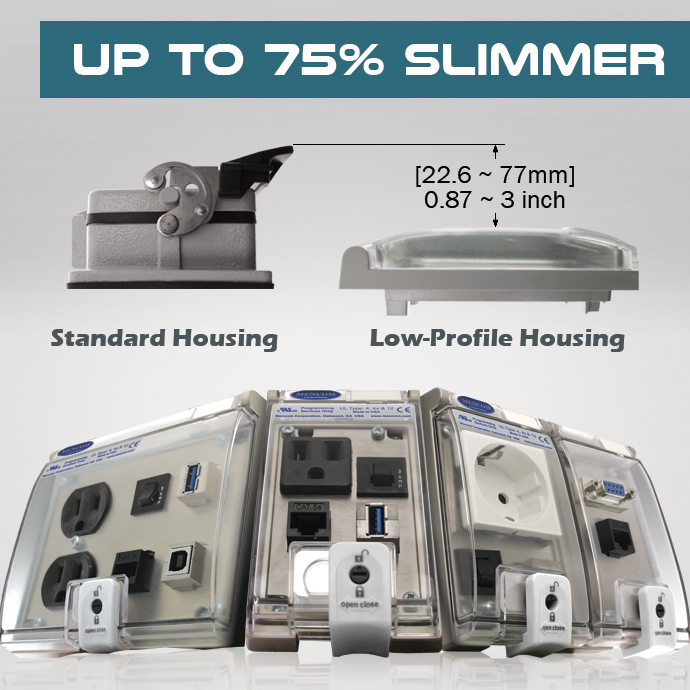 The Low-Profile housings are UL listed and available in three sizes; one single cover (LP1), two single covers (LP2) and one double cover (LP3). The transparent polycarbonate cover allows users to see which components are within the enclosure. These enclosures provide an IP65 rating, and feature a unique locking mechanism. The lock is located on the sliding latch and can be operated using a standard flat head screw driver. For those environments that do not require as much protection, all of our PIC designs are available as a plate that is mounted directly to your cabinet, without the need of a standard or low profile housing. Mencom, as an industry leader of PICs, currently has well over 3,000 designs in production. Remarkably however, our experienced engineer team is still creating new designs almost daily to meet the various market demands. In addition to the standard and low profile Panel Interface Connectors, Mencom also offers circular port adapters that allow you to pass a variety of components from RJ45 cables to USB cables through your panel. We even have an RJ45 pass-thru that is rated to IP67 while in use, or when capped off.